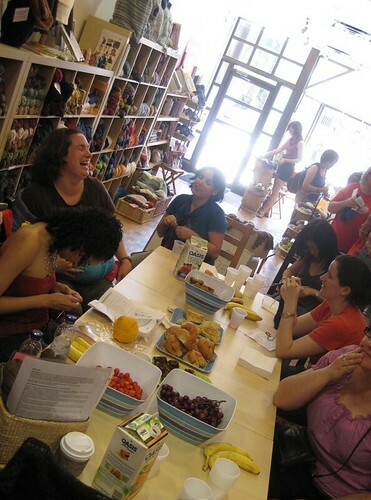 This past Saturday I joined in on this year’s TTC Knitalong, as one of the team captains on an unprecedented 5 teams! There were 75+ participants and many dollars raised once again for charity. This time our tote bags were also pre-filled with generous donations from several of the shops on the route, as well as Patons, Bernat, Plymouth yarns, and even a few books donated. And boy, did we ever fill up the bags throughout the afternoon. I was on Team East Blue, heading from the Naked Sheep to the Purple Purl, then Americo, and finishing up at Romni. Beautiful wares to be had at all the shops. I definitely stocked up on a few more skeins of sock yarn, some spinning fibre, and notions. Thanks to everyone who came out and I hope a good time was had by all! Here are a few photos from the day. In my next post I’ll catch up with some of my new projects on the go – and later this week I am indeed hoping to get some more photos of my finished Bridgewater shawl, as it is well worth the extra photography! In the mean time, stay knitterly, my friends. Wow, that looks like so much fun! 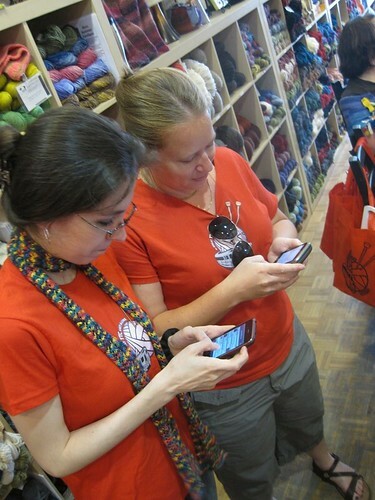 I especially love the woman hugging the yarn and the two women in orange synchronizing their iPhones!! Lucky you! that looks like sooo much fun! Maybe I can plan a visit to Toronto for next year! Sweet 🙂 I love the photo of Meredith and I tweeting away at the Naked Sheep. It almost looks like I know how to use my phone! 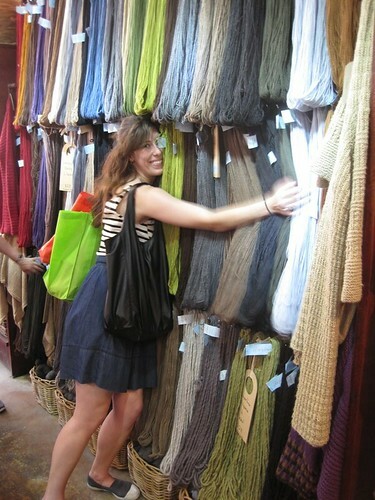 The “hugging of the yarn wall” looks like something I’d do! Man, I haven’t hugged any fiber lately, maybe I need to dump the stash on the floor and have a go at it…. I love seeing your images of this event! We don’t have public transportation locally, so our KIP events can’t move about. I guess I could go to a nearby city, but from experience I know that they are not as nice as Toronto. I loved Toronto when I visited two years ago, made me want to live there! 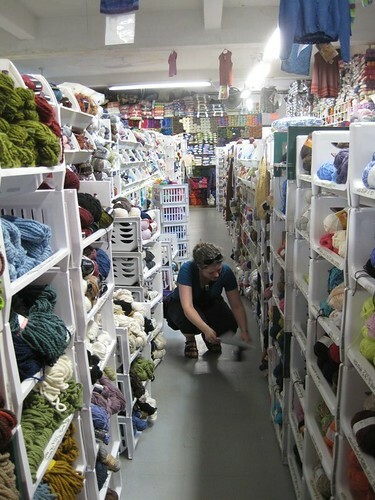 I’ve never even heard of a yarn crawl before. What an excellent idea. It looks like great fun. I’m sorry I didn’t do it again and join you all, it looks like it was a fantastic time this year! anyway, you’ll have a great time in san francisco. i was just there last month and it is such a beautiful city. i was only there for a weekend and wasn’t able to check out any yarn stores but a sunset dinner by fisherman’s wharf is a must-go for you! My favourite photo is of the women knitting on the bus. I wonder if that freaked out any of the other passengers? 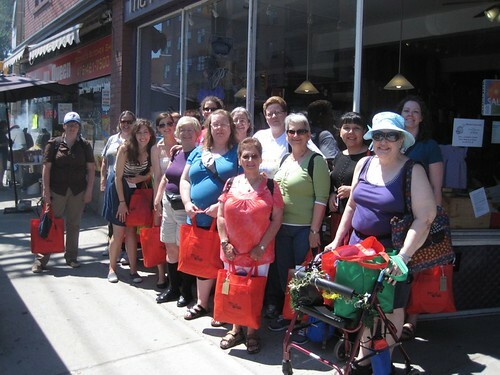 oh, such a fun day — makes me miss Toronto! Great pictures. It looks like you all had a lot of fun. 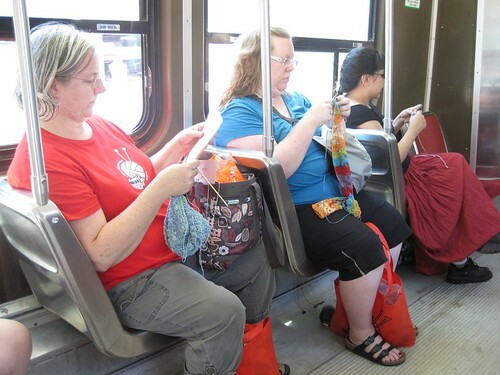 I love to see so many pictures of people knitting in public (the train/bus picture). Is there a site for these crawls? I’m new to the knitting world (just been knitting a year or two on my own) and I’d love to join next years! That looks like a perfect day! And guilt free, too, since it benefits charity? I’m going to echo Steph and ask how one finds or sets up such an event! what fun! how does one join in … just for future reference?? ← Tra la la, tra laaa la, tra lalalalalaaaaa….